With these tie-ins, it’s always tricky. The Thor 2 tie-in was all but name only, while the Captain America 2 tie-in was ground-shakingly integral to the plot of the show. This episode tries a new tactic: directly setting up the events of the film. With the focus on Dr. List’s Arctic HYDRA base, the connection is clear and obvious, without feeling forced. After all, the big points of this episode are exactly the same ones that have been active all season on SHIELD: HYDRA and their obsession with superpowers, and people with powers of both innate and man-made origin. By using the themes of the show to naturally connect with its relationship to the film, it all feels perfectly justified without having SHIELD reduced to superficial clean-up or having its entire season derailed (onto an admittedly better track) by the movies. Splinter bomb is just a really brutal weapon. But onto the episode. The teasers and plot descriptions made it sound like Gonzalez and Coulson would be joining forces, but that’s barely true. We’re starting to see that Gonzalez, for all his talk of transparency and democracy, is just as filled with secrets and his own agendas as he accuses Coulson of being. And we see why that whole voting thing isn’t exactly cut out for an organization that has to be responsive the way SHIELD does. I mean, before May joined, they had 4 executives, it seems–what did they do in the event of a tie, as it would’ve been if she wasn’t there? Debate the point until it was irrelevant? It’s not an attack on the idea of democracy to call this a bad idea. There’s a reason generals don’t poll their soldiers before launching an assault, after all. One of the side effects of all this, however, is that “real SHIELD” is losing its grayness, and keeping Skye and Lincoln locked up at the end of the episode seals the deal on that one. Getting the original six cast members back together is the most important thing happening here, from a strict show-exclusive point of view. This is the first time everyone’s been in the same room since season 1, and it shows. Simmons has become dark and dangerous; Fitz stands off, almost in the background, isolated from the front lines. 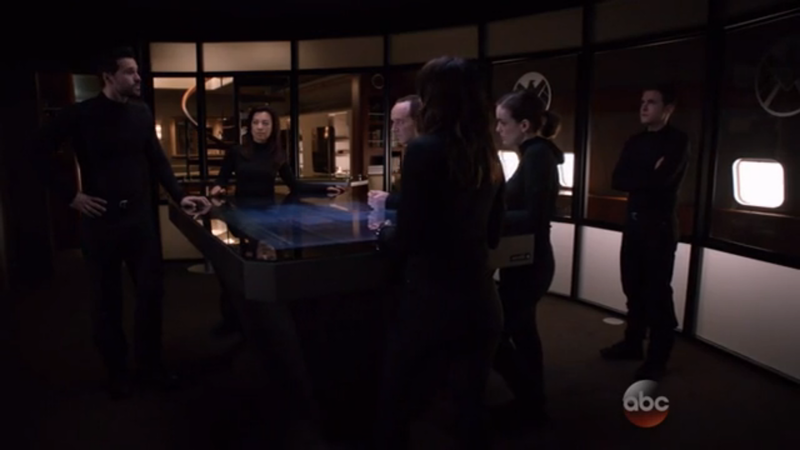 The group stands on one side of the table, and Ward on the other, making it clear they’re still against him. Even speaking his name seems to leave a bad taste in the mouth for Skye, Simmons, and the others. 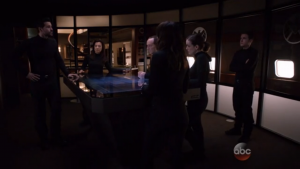 May and Coulson stand together, but a growing gap appears between them, even as they defend each other. And all Skye can do is reiterate her certainty about shooting Ward, exhibiting the cold training she’s picked up from May over the season. Almost in spite of all this, however, they continue to function amazingly well as a unit. It’s at this point that we have to pause to talk about Simmons. She’s made a huge step in this episode, continuing the dangerous and reactionary trend she’s been on. The splinter bombs are a particularly horrible way to die, and Simmons is hardly one to suspect of murderous impulses. 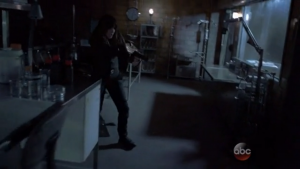 And as viewers, we’ve all no doubt wanted to see someone get vengeance on Ward, almost as much as she does. But what cost does that come at, here? Ward survives, but the point he makes in response is hard to argue with. Simmons’ actions here are a disappointment, a newly introduced failing in the character who had started off so innocent. The things she’s been through and seen this season have dragged even her down to this level. Putting this in the context of her fear and hatred of superpowered individuals, and I fear what may happen when she next sees Raina. This shot was absolutely amazing. It proves that superpowers aren’t necessary for an awesome action sequence. As a result of all that, we had Bakshi die this week, but then again, he wasn’t really Bakshi any more. The “real” Bakshi died when he was brainwashed. In some ways, it was a mercy to kill him, but Simmons certainly didn’t have that in mind, and while she was bothered by it in the moment, she got over it quickly. The moment packs more punch in what it means for her character than it does as the death of a character who’s been a villain for most of the season, which is in some ways disappointing. Still, it is quite the karmic justice for someone whose main schtick was brainwashing. The other big loss in this episode was the Bus’s destruction, which was shockingly underplayed. That plane had been home to Coulson and his team for 2 seasons now, and yet it wasn’t even really touched on as to what that might mean to them. Hopefully that will come into play next week, because it’s far too big of a thing to ignore. Minor spoilers for the rest of the season from this point on. All around, a good episode of SHIELD, and a great example of a TV/movie tie-in. Some great shots, even better zingers, and quite possibly the funniest joke of the season. Hopefully next week picks up some of the pieces that were left behind, and we still have Age of Ultron this week to tide us over until “Scars.” See you then–or maybe in line for the midnight release!